Rows 2 to 6 - ch3, * 1dc in each dc to 3dc group, 1dc in next dc, 3dc in centre dc on 3dc group, * rpt from * to * to last 3dc group, 1dc in next dc, 3dc in centre dc on 3dc group, 1dc in each dc to end, 1dc in top of ch3. Turn. You should have 92dc + ch3 at the end of Row 6. Fasten off. Pattern Row 1 - ch3, 1dc in next sc, * ch2, skip picot, 1dc in each of next 3sc, * rpt from * to * to last picot and sc, ch2, skip picot, 1dc in last sc, sl st to top of ch3 on beginning of row. Turn. Pattern Row 2 - ch1, 1sc in base of ch1, 1sc in next dc, * (1sc, ch3, sl st to 3rd of ch3, 1sc) in next ch2 space, 1sc in each of next 3dc, * rpt from * to * to last ch2 space and dc, (1sc, ch3, sl st to 3rd of ch3, 1sc) in ch2 space, 1sc in dc, sl st to first sc on beginning of row. Turn. Rpt Pattern Rows 1 & 2 twice. Fasten off. Turn. Once in color 2. Fasten off. Three times in color 1. Fasten off. Twice in color 1. Fasten off. Button/Buttonhole Borders - Starting with RS facing on lower edge of right hand side of back opening, rejoin yarn to side of dc on the skirt, ch1, 1sc in base of ch1, work 13sc evenly up first back edge to corner, 3sc in corner, 1sc in each ch around neck to next corner, 3sc in corner, 14sc evenly down second back edge. Turn. Starting with ch1, 1sc in base of ch1, work 1sc in each sc and ch2 space to corner. Fasten off. Return to first side of back opening and working from neck downwards ch1, 1sc in base of ch1, 1sc in each sc to end. Fasten off. Finishing - Sew in and tie off any loose ends of yarn, sew on buttons to correspond with buttonholes, decorate with ribbon. Row Two - ch3, 1dc in base of ch3, 2dc in each of next 11dc, sl st to top of ch3 on beginning of row. DNT. (23dc + ch3). Row Three - ch3, 1dc in base of ch3, 1dc in next dc, * 2dc in next dc, 1dc in next dc, * rpt from * to * to end, sl st to top of ch3 on beginning of row. DNT. (35dc + ch3). Row Five - Working in front loops only, ch1, 2sc in base of ch1, 1sc in next dc, * (ch3, sl st in 3rd of ch3) 1sc in each of next 5dc, * rpt from * to * to last 6dc, (ch3, sl st in 3rd of ch3) 1sc in next dc, 2sc in next dc. Turn leaving last 4dc un-worked. Row Six - ch3, 1dc in next sc, * ch2, skip picot, 1dc in each of next 3sc, * rpt from * to * to last picot and 2sc, ch2, 1dc in each of last 2sc. Turn. Row Seven - ch1, 1sc in base of ch1, 1sc in next dc, * (1sc, ch3, sl st to 3rd of ch3, 1sc) in next ch2 space, 1sc in each of next 3dc, * rpt from * to * to last ch2 space and dc, (1sc, ch3, sl st to 3rd of ch3, 1sc) (picot made) in ch2 space, 1sc in dc, sl st to first sc on beginning of row. Turn. Rpt Rows Six & Seven twice. Fasten off. Rpt Rows Six & Seven once in color 2 and once in color 1. Fasten off. Back Frill - With crown towards you and working in loose loops (back loops of the front loops previously worked on Row Five), join in color 2, ch1, 2sc in base of ch1, 1sc in next dc, * (ch3, sl st in 3rd of ch3) 1sc in each of next 5dc, * rpt from * to * to last 6dc, (ch3, sl st in 3rd of ch3) 1sc in next dc, 2sc in next dc. Fasten off. With RS facing, rejoin color 1 to front of bonnet, working along neck edge, ch3, work 2dc in each row end to end. Fasten off. Finishing - Weave in any loose ends of yarn, thread ribbon through alternate dc's along neck edge. 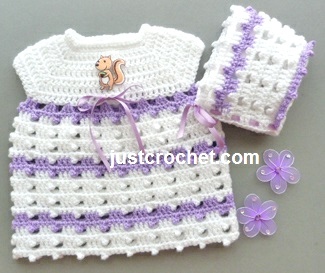 Hope you enjoy this free baby crochet pattern for a preemie dress and bonnet.